Rental car companies no doubt have to deal with many kinds of customers and problems, but it was nonetheless surprising, having rented a car at the Kuala Lumpur airport, to read the following notice in our vehicle: "Tariff will be doubled if pungent odor of durian pervades the vehicle." The large and infamous durian fruit of Southeast Asia exudes a powerful smell reminiscent to some of rotting garbage, and to others of sherry trifle. Like so many tropical fruits, the flavor of the pulp is rich and sensuous, albeit with hints of fermentation if not actual decay. It's clearly attractive to lots of animals, and many humans will pay top price for the luscious taste and texture of a ripe durian. How did such botanical exuberance evolve in the first place, and what biological factors have motivated the expression of such tastes and odors? Why should durian pulp be sufficiently smelly as to offend car drivers in Malaysia, and what's the link between fruit sugars and decay? It's easy to get lost in a tropical rainforest, because most of it is a lovely green and looks pretty much the same. When we walk about, what we see are mostly leaves, followed by twigs, branches, and tree trunks. Photosynthesis by leaves, together with the woody structures that support them, represents the primary investment in the economy of plant life. Flowers, fruits, and seeds are much less common in space and in time, but the intermittent bouts of reproductive activity by flowering plants can be spectacular. Floral displays blanket the crowns of trees and shrubs, bright clusters of fruits hang from the ends of branches, and layers of fallen fruit decompose on the forest floor. Most obviously, the often vivid colors of fruits and flowers contrast radically with photosynthetic greenery, indicating different underlying physiologies as well as ecological roles. The typically brief but glorious existence of these reproductive structures provides an esthetic window into the sexual life of plants and into the powerful forces of selection that have molded them through evolutionary time. Flowering plants, known botanically as angiosperms, originated about 140 million years ago in the geological period termed the Cretaceous. The technical definition of a flowering plant actually refers to the nutritious packaging around the seeds within an angiosperm's fruit, rather than to the flower itself. The associated sugars and fats which nourish the seeds provided a substantial source of energy that was attractive to and readily consumed by rapidly diversifying bird and mammal communities more than one hundred million years ago. As a consequence of eating fruits and then depositing the seeds elsewhere, these animals provided to plants the benefit of long-distance dispersal to new habitats. Since the Cretaceous and onwards into the present, fruits (both dry and fleshy) have become an obvious feature of plant biology in many terrestrial ecosystems. Sugar-rich fruits remain today a common and important aspect of many tropical and temperate-zone forests. When domesticated, these fruits-including such moist and fleshy ones as tomatoes, bananas, and apples, along with dry seed-containing fruits such as grains and nuts-represent a major component of the contemporary human diet. We sensorily experience the evolutionary wonder of fruits every time we wander in the produce section of the supermarket. The two-way interaction between fruits and their animal dispersers is a well-known example of the evolutionary outcome termed mutualism. Both participants benefit in a mutualistic interaction, and the tightness or specificity of the association often becomes greater with time. Similar dynamics have characterized the evolution of flowers and the various animals that pollinate them in exchange for the caloric reward of sugar-rich nectar. The amazing displays of floral color that we visually appreciate today originated to meet the energy demands of a huge range of insects and vertebrates. Indeed, much of modern-day plant diversity can be linked to the parallel enlistment of floral pollinators and vertebrate consumers attracted for the purposes of nutritional payoff. Ripe fruit thus represents the coinciding interests of animal appetite and the dispersal of plant progeny. One of the consequences of this mutualism has been an increased diversity of morphological, physiological, and (for animals) behavioral traits that facilitate more efficient interspecific interactions. More obvious fruit, better searching strategies, and more specialized vision among frugivores are some of these evolutionary outcomes, along with enhanced species diversity of both angiosperms and animal consumers. We live in a world dominated ecologically by flowering plants and, by association, their seed-containing fruits. This outcome is most obvious in the tropical and subtropical regions, where riotous assemblages of herbs, shrubs, vines, saplings, and trees vigorously compete for access to light. These forests can be structurally complex, with no well-defined transition between the ground cover and the canopy. Vegetation is simply profuse and confusing to the human eye, yielding the iconic imagery of the tropical rainforest. Also in the tropics, plant species diversity is famously high. Unlike the coniferous forests of boreal regions, tropical rainforests are numerically dominated by flowering plants. Species richness here can be overwhelming even to botanical specialists. For example, Barro Colorado Island in the Republic of Panama has been a nature reserve since the completion of the Panama Canal and the filling of surrounding lowlands with water in 1914. Over 1,250 species of flowering plants can be found on this small island, which is only about sixteen square kilometers in area. By contrast, the more primitive seed-bearing plants that do not bear flowers are represented by only one species. With the exception of the higher-latitude coniferous forests, terrestrial vegetation worldwide is similarly dominated by plants that bear flowers and, in many cases, fleshy fruit. On Barro Colorado Island, the morphological range of fruits produced by the flowering plants is impressive (see plate 1). Such taxonomic structuring of terrestrial ecosystems was not always the case in earth's history. Prior to the diversification of flowering plants, these ecosystems were dominated by such seed-bearing groups as conifers and cycads, along with numerous lower plants, including tree ferns and mosses. Pollination in these groups is typically by means of wind, or even by water transmission of gametes in more primitive forms. By evolving first flowers and then fruits with internalized seeds (sometimes in the form of nuts), animals could be enlisted in a more targeted dispersal of pollen and fertilized embryos (i.e., seeds). Surrounding the seed with sugars and delicious fats induces consumption of the ripe fruit by vertebrates. Animals seek out these nutritional rewards around the seed and then relocate it elsewhere once it transits through the gut. Sometimes abrasion by the digestive system and its associated enzymes is even a prerequisite for seed germination. During the initial stages of angiosperm evolution, dinosaurs may have consumed their fruits, given that mammals and what we know today as birds (i.e., dinosaurs with wings) were not yet present on the earth. Subsequent evolution of these latter groups in the last sixty million yearshas been paralleled by corresponding taxonomic and morphological diversity in fleshy and reward-providing fruits. Nowhere is this biological outcome more apparent than in the tropics. One of the great pleasures on earth is to spend time walking, watching, smelling, touching, and listening within a tropical rainforest. Lush vegetation, bewildering insect species, and hyperdiverse bird and mammal communities compared to those in the temperate zone have alternately inspired and profoundly discouraged scientific investigators. The diversity can simply be overwhelming. And to this day, there is no fundamentally convincing explanation for the so-called latitudinal species gradient, whereby virtually all groups of plants, animals, and fungi are much more species-rich as one approaches the equator. Certainly for sugar-rich fruits and for those animals that consume them, the tropics are home to a number of spectacular evolutionary experiments. For example, street markets in tropical countries typically display a wide range of colorful and fragrant fruits unavailable in the temperate zone. Often intensely sweet, with distinctively aromatic flavors, these fruits, when ripe, are squishy and easily crushed, thereby precluding the sophisticated packaging and transportation required for distribution in more industrialized nations. Such fruit displays reflect more generally the amazing range of plant products available in the forests. In lowland tropical rainforests, anywhere from 50 to 90% of all flower plants are visited by fruit-eating birds and mammals, which number in the thousands of species worldwide. One important example of such fruiting trees are the palms. With over 2,600 species found mostly in the tropics, palms provide large quantities of sugary fruits to many different kinds of animals. A typical palm is Astrocaryum standleyanum, a common species in lowland Central and South American rainforests. This species bears very large fruit crops (see plate 2), with each cluster weighing up to twenty kilograms. The fruits are consumed by a broad diversity of animals, including red-tailed squirrels, spiny rats, kinkajous (an arboreal carnivore that eats mostly fruit), Central American agoutis (a large rodent), collared peccaries, howler monkeys, and white-faced capuchin monkeys. The palm fruits start out green and unripe but mature over the course of several months to turn a distinctive orange, with sweet, rich, and odoriferous pulp. Some animals manage to surmount the spine-covered trunk of the palm to consume fruit from the heavy clusters. More typically, fruits fall to the ground, where they are stripped of their pulp by various feeders. Agoutis in particular are fond of these palm fruits, and they relocate and bury the seed for future consumption. This is a mutualistic interaction beneficial to both agouti and palm, as not all buried seeds are subsequently found and consumed by the rodent. Those undiscovered will then germinate and contribute to the next generation of palms. Fruits not eaten by animals will rapidly turn a darker orange and then black, becoming truly rotten and disgusting. Bacteria eventually consume all available sugars in this process. Another major group of fruit providers in the tropics are the figs. With over 750 species in what is the largest plant genus (Ficus), big fig trees are a common sight in lowland tropical rainforests. Their ripe fruits provide abundant pickings for some bats, many primates, large birds such as hornbills and toucans, and a diversity of smaller birds and mammals. Figs as well as palm fruits have been termed keystone resources for tropical vertebrate frugivores, providing a substantial fraction of many animals' daily energy requirements. These fruits can be particularly important during periods of scarcity in the forest, when most other plant species are not fruiting because of seasonal weather patterns. Figs and palms, by contrast, provide more reliable crops to the benefit of the animal consumers. Another important feature is that these fruits are often fairly large. In the lowland rainforest of Barro Colorado Island, for example, the average size of figs and palm fruits is about 1.5 centimeters. Such fruits are also typically available in aggregate, often within hanging clusters or bunches, and represent a huge meal to those who can find them. But before figs can be eaten, they must undergo a complex series of changes to reach the point of being attractive to consumers. First, all fruits must begin their development within a pollinated flower. Following fertilization of the female gametes, the reproductive tissue of a flower grows and begins to sequester nutrients, mostly starch, from other regions of the plant. Seeds within the fruit mature simultaneously but remain inviable up to the point of maturity. The fruit remains green and unpalatable throughout this time, as premature consumption of the fruit by animals would inevitably result in destruction (rather than dispersal) of the seeds. Immature fruits are thus tough and are often chemically defended by nasty tasting compounds (such as tannins) so as to deter such an outcome. Biting into and then spitting out unripe peaches or apples is perhaps the closest we come to experiencing these defenses, but in the real world animals quickly learn to avoid such unripe fruits, except in conditions of extreme hunger. At a certain stage of development, however, fruits become ripe and attractive to their animal consumers. Physical and chemical defenses are relaxed, and otherwise relatively indigestible starch molecules and other complex carbohydrates are converted to simple sugars. The fruit thus becomes sweeter and more attractive to microbes, as well as to monkeys and other vertebrates. This ripening process involves a number of different internal changes that influence both structural and biochemical properties. In the transition to ripeness (and ultimately to being over-ripe), fruits typically enlarge, increase their water content (effectively becoming juicier), change color, become softer, and reduce their chemical defenses. These features typically change in concert and are regulated by a number of different hormonal pathways. For many fruits consumed by diurnal (i.e., day-active) birds and mammals, the goal of this process is to provide an end product that is both obvious to animals at a distance and ready for consumption. Surface color alone is often sufficient to indicate ripeness, given the marked shift from an unripe green to red, purple, yellow, orange, or even blue in some cases (plate 3). Some fruits exhibit this brightness in the ultraviolet as well. Changes in odor are equally pronounced, as the fruit advertises its presence with a wind-borne aromatic signature composed of many different volatile molecules. Bat-dispersed fruits in particular are characterized by chemical odors signaling ripeness, as visual cues are much less effective for these night-flying animals. Texturally, ripening fruit becomes much softer as cell walls are degraded enzymatically. Sugar content increases dramatically, and the indigestible and sometimes toxic compounds that characterized the green unripe fruit are broken down. In the tropics, sugars provide the primary nutritional reward within ripe fruits. There are some oily fruits such as avocados, however, that contain little or no sugar. These instead contain calorically dense fats as an enticement for consumption. Oily fruits actually tend to be much more common in temperate-zone ecosystems, where fruits are primarily consumed by birds. In the autumn, migratory birds in particular are major visitors to fruiting trees and shrubs. Fats are much more energetically dense than sugars and are much better suited for long-distance migrants trying to minimize weight. By contrast, ripe tropical fruits contain mostly sugar, with values typically ranging from 5 to 15% of the pulp mass (but occasionally with a sugar content as high as 50%). Tropical fruits also tend to be more watery and larger than those in the temperate zone (think of mangos and papayas, for example). Too much investment in sugar may represent an inordinate cost relative to the potential evolutionary benefits associated with attracting an animal. Nonetheless, such fruits represent a substantial caloric reward to the individual that finds them. Additional players, however, have contributed to the interesting biological outcome of the ripe fruits that we and other animals enjoy today. Coincident with the evolution of sugar-rich fruits, yeasts evolved the ability to produce alcohol, apparently to kill off bacterial competitors. As green fruits progressively ripen and then rot, various microbial agents of decay grow and develop, simultaneously devouring any available sugars. When a fruit is ripe and ready for consumption, a variety of visual, chemical, and textural cues then advertise the availability of calories to a bird or mammal. We subconsciously use these cues when shopping in the supermarket for fruits and vegetables, and chimpanzees use them high up in rainforest trees when selecting figs for consumption. Where there are ripe tropical fruits containing sugar, there will also be fermentation by yeasts. Those animals that happen to eat these fruits will, therefore, also be inadvertently consuming alcohol. Today's foraging behaviors by birds and mammals are thus superimposed on a historical background of ecological interactions and intense microbial combat within fruits that first turned up millions of years ago. The basic themes of competition for fruit sugars, fermentation, and dietary exposure to alcohol are thus both ancient and persistent. Our perspectives on fruit are largely shaped in modern industrialized countries by their availability in supermarkets. However, large displays of uniform and unblemished fruit are really not representative of conditions in the wild. Domestication over millennia has yielded major shifts in fruit size (mostly via increased water content), sugar composition, and texture. Most recently, the demands of long-distance transport to market have imposed requirements for durability and ease of packing. Such changes, in aggregate, have produced fruits that but little resemble their natural genetic predecessors. Many fruits in the wild are riddled with insect larvae, fungal rot, and other such infestations. What the grocery industry considers to be ripe fruit ready for consumption is relatively disease-free and sweeter than that typically eaten by animals in the wild. Our concept of ripeness is also mediated culturally. Some people won't peel open a banana if there is a single dark spot on the skin. By contrast, others are much less sensitive to the consumption of over-ripe fruit, particularly when they are hungry. Ripeness in the real biological world, by contrast, means only that a fruit must be sufficiently adequate for consumption, even if the nutritional rewards are not necessarily ideal from the perspective of the consumer. Selection will only act on a plant's progeny if they survive to reproductive maturity. Any relocation of a seed, no matter how effected, can therefore be advantageous. Fruits are certainly more susceptible to microbial decay once ripeness is attained, given the greater sugar levels. But even during the process of fruit formation and development there exist the possibilities of bacterial infection, germination of yeast spores that landed at the flower stage, mechanical abrasion and consequent microbial invasion while on the twig or branch, and infestation by insects. The relaxation of chemical and structural defenses during ripening inevitably increases the chances of incipient rot and decomposition. Even when ripe, considerable time may pass before a fruit is actually found and eaten, a period during which both bacteria and fungi may flourish. In essence, there exists an ecological race in time between the agents of decomposition and those of consumption. Microbes and animals compete to take advantage of available sugars. If sufficiently far progressed, bacterial rotting and decay can potentially discourage consumption by frugivores. Seeds within the fruit will correspondingly not be relocated far from the parent tree and may suffer increased mortality. Given that microbial growth rates can be really high, particularly in the warm, humid tropics, bacteria and fungi present a real threat to the reproductive interests of flowering plants. Microbes are omnipresent and happily devour plant and animal tissue alike, including our own when given the opportunity. If we observe naturally occurring fruit fall in most regions of North America, individual fruits often stay in place for weeks or even months. Small sections can be consumed by insects and fungal spots may appear, but decomposition proceeds only slowly. Unless a passing animal or human physically removes the fruit, it will remain there, remarkably unperturbed by decay. By contrast, similar observations of fallen fruit in the lowland tropics result in a substantially different outcome. Insects and microbes find and colonize fruit within minutes, and the likelihood of a wild vertebrate removing and eating them is much higher. Decomposition proceeds quickly, and within days the fruit is but a black and rotten remnant. Microbial growth is particularly temperature sensitive, and the elevated and also fairly constant air temperatures in lowland tropical regions predispose fruits to quick decay. Animal carcasses similarly disappear within days in tropical forests, yielding a nasty malodorous plume, along with vultures in abundance. The theme of rapid decomposition is thus paramount in the humid tropics. Much of this decay occurs internally within the guts of termites, which compose the majority of animal biomass within tropical rainforests. Using protozoans that live in their midguts, termites can successfully degrade the cellulose molecules of plant cell walls. Similarly, varied kinds of fungi are abundant in decaying plant material, with their microscopic extensions permeating the leaf litter, soil humus, and rotting logs. The capacity to break down cellulose is an ancient biochemical pathway and certainly assisted fungi as they first colonized the land in concert with advanced plants. However, the tendency for certain groups of fungi to engage in sustained alcoholic fermentation turned up only much later in evolutionary time and is found in only a small subset of all yeast species. Not surprisingly, the most widespread of these today is the one co-opted by humans for brewing and wine-making, Saccharomyces cerevisiae. This species, which is also used in bread-making, has essentially been domesticated through its thousands of years of association with cuisine. In tropical environments, many other species of fermenting yeasts can also be found in association with ripe and over-ripe fruit. The common feature of all such yeast assemblages is competition with bacteria and the ensuing production of alcohol. But what exactly is the chemical process that yields such an interesting molecule? After considerable speculation in the mid-nineteenth century, it was Louis Pasteur who first proved experimentally that fermentation requires both the presence of sugars and the metabolic activity of yeast as a necessary biological participant. Intriguingly, yeasts can produce alcohol in the complete absence of oxygen. Such fermentation is accordingly known as an anaerobic process, and was identified as such by Pasteur when he termed it to be "la vie sans l'air." This was a remarkable finding that, in retrospect, has important consequences for our understanding of the evolutionary origins of this metabolic pathway. Fermentation to yield a variety of non-alcoholic compounds is actually an ancient biochemical process used by many different kinds of microbes to produce energy-rich compounds. Plants can also engage in anaerobic fermentation under certain conditions, as when roots become submerged. On the geological timescale, this metabolic pathway well preceded the origins of sugar-rich fruits. However, the flowering plants of the Cretaceous provided within their fruits a new arena of simple carbohydrates well suited for fermentation and the associated generation of alcohol. When sugar levels are very low, fermenting yeasts produce no alcohol. Sugars are simply burned up aerobically to contribute to growth and metabolism. Sugar at concentrations greater than 0.1%, however, suppresses such activity via a well-studied biochemical switching mechanism that turns on the pathway of alcohol production. Increasing sugar concentrations thus elicit anaerobic fermentation even when oxygen is present. For yeast cells growing within watery fruit pulp, conditions are probably oxygen-deprived in any event, and fermentation is the order of the day. Alcohol builds up accordingly. In fact, the fermentation of fruit sugars by yeasts yields a number of different alcohols and end products, including glycerol, acetic acid (i.e., vinegar), lactic acid, and numerous aromatic compounds. It is the short-chained ethanol molecule that is the predominant alcohol, however, contributing about 90% of the total yield. Additional compounds, including the fusel oils (so-called higher alcohols with longer chain molecular structures), contribute to the flavor and bouquet of alcoholic beverages, but these are clearly second-order participants. If we are to look for a good explanation for anaerobic fermentation, then we should concentrate on alcohol per se. However, production of this molecule by yeast is a surprising result given that complete oxidation of a sugar molecule (in this case, glucose) yields as many as thirty-eight molecules of energy-rich adenosine triphosphate, whereas fermentation of glucose to alcohol (i.e., ethanol) yields a paltry two molecules. Alcohol molecules thus retain high energetic content, an outcome perhaps most obvious in the interesting if perhaps grotesque phenomenon of the beer gut. Drinking a lot of booze clearly packs on the intrinsic calories of the alcohol molecule. Surprisingly, only about 5% of potential metabolic yield is realized by yeast using anaerobic fermentation, relative to what they could achieve with full oxidation of the sugar molecules. Why then do yeast cells bother to produce alcohol at all? They could presumably get much more energy by fully oxidizing all available carbohydrate, but evolution has apparently preferred an alternative solution that, in a broader perspective, must yield greater long-term results. Here is where a historical perspective on biology is critical for explaining seemingly inefficient, energetically disadvantageous, or simply foolish behaviors. Using DNA sequencing and sophisticated methods of evolutionary analysis, it is possible to reconstruct the history of the fungi. This exercise places the origin of the fermenting yeasts back to the mid-Cretaceous, roughly corresponding to the period about 120million years ago when flowering plants first arose and began to produce fleshy and sugar-rich fruits. Although there is some uncertainty as to the correct rates of the molecular clocks used in such estimates of deep time, the broad temporal congruence of these two events is suggestive. There must be some link between yeast fermentation and the internal environment of the fruits within which they thrive. What then might be the non-energetic benefits accruing to yeasts that produce alcohol? To date, the best explanation is that this alcohol acts to inhibit microbial competitors. Initially, sugar concentrations within ripe fruits are high but yeast populations are low. Growing yeasts typically produce much more alcohol than those at rest, and both yeast population densities and alcohol levels rapidly climb. Competing bacteria, in spite of their much faster growth rates relative to those of yeast, are at a disadvantage because their capacity to reproduce is progressively inhibited as alcohol concentration increases. Substantial osmotic stress associated with both alcohol and high sugar concentrations also dehydrates bacterial cells. By contrast, yeasts have a much greater tolerance for alcohol. In fact, yeast growth is inhibited only at levels of 10 to 14% (i.e., at levels typical of many wines), depending on the kind of yeast and the particular conditions of temperature and pH that surround it. Bacteria, by contrast, are killed off by much lower alcohol levels, mostly because of their much simpler cell membranes. Yeasts can thus beat up on the bacterial competition through a form of chemical warfare. Moreover, the interior of unripe fruits also tends to be somewhat acidic to deter premature consumption by birds, mammals, and possibly some microbes as well. Here, the yeasts have a real advantage. Growth rates of bacteria are substantially inhibited at pH levels below 6.0, whereas fermenting yeasts do better at the much lower values characteristic of unripe fruit (typically pH values of 2to 5). Therefore, yeast can gain a larger share of the carbohydrate resources of a fruit by suppressing bacterial growth. This relative advantage for yeast under these acidic conditions, when coupled with the inhibitory effects of alcohol on bacteria, yields an overall competitive asymmetry for yeast populations. Alcohol levels correspondingly rise, sugars decline from the levels characterizing peak ripeness as they are consumed by yeasts, and the bacteria are held in check. Secondarily, the yeasts will then shift to burning up the alcohol molecules themselves when sugars are no longer present. The fruit itself, assuming it has not been consumed by an animal sometime during this process, will then ultimately succumb to bacterial rot. Fermenting fungi thus act as the primary agents of decay, assuming that they have been able to colonize the fruit to begin with. Not surprisingly, the life cycle of yeasts predisposes them to development within and on fruit. In the natural world, fermenting yeasts will invade a sugary habitat and grow rapidly via asexual budding. Intermittent sexual reproduction also produces large numbers of spores. These spores are small, on the order of several microns, and once released from a substrate, are readily wafted about in the air. They thus can easily inoculate developing fruits from the surface and work their way inwards. Fruit flies and other insects such as bees and wasps also inadvertently move yeasts from plant to plant, which may select for volatile attractants such as alcohol, which promotes such visits. More cleverly, many fungal spores land first on flowers and are then encapsulated into the fruit tissue as it develops from the fertilized flower. This latent infection yields, for example, avocados rotted from the inside out, an occasionally disconcerting experience for those who purchase otherwise unblemished fruits from the grocery. Many kinds of yeasts can typically be found either within or upon the surface of fruits in both the temperate and the tropical zones. Bacteria omnipresent in the air and on plant surfaces are similarly opportunistic colonists. Yeasts and bacteria may thus grow side by side within fruit, although growth rates of both are low while the fruit remains unripe. Plants are not oblivious, in evolutionary terms, to the presence of these microbial agents of destruction. Many fruits are fragrant and aromatic precisely because of the presence of many antimicrobial compounds. Consider, for example, the pungent taste of a ripe mango, the zest of lemons and oranges, and the many other fragrant aromas of tropical fruits. Because of the intrinsic reproductive value of developing seeds, there has been considerable evolutionary pressure on plants to express antimicrobial compounds within their fruit. These chemical defenses must coexist with the palatable and nutrient-rich pulp which animals will consume. There can also be intense competition for sugars among different yeasts within the same fruit. So-called killer strains sometimes turn up and secrete toxic molecules which serve to neutralize other yeast strains growing on the same substrate. These killers can occasionally colonize and spoil grape batches collected for wine fermentations and are thus feared by vintners. Similarly, some kinds of bacteria can colonize alcoholic fermentations and convert them to vinegar. This microbial finale is often the endpoint of an opened but subsequently neglected bottle of wine. Refrigeration dramatically slows this process and, along with stoppering to impede oxidation, is recommended for partially consumed bottles. The role of yeasts in influencing the likelihood that a fruit will be sensed at a distance and ultimately consumed by an animal is difficult to assess. Overall, sustained microbial rot tends to reduce fruit attractiveness, but the parallel time course of alcohol production as a fruit ripens and then decays may offset this trend. Yeasts are more likely to be producing alcohol early on in a ripening sequence, given that simple sugars become progressively more available. And the numerical dominance of yeast relative to bacterial populations likely sustains the palatability of a fruit, as it does with rising bread. Also, if alcohol emanating from a fruit serves to attract vertebrate dispersers, it may be in the plant's best interests to tolerate a certain amount of yeast growth, as the small loss in carbohydrates may be more than offset by an increased chance of discovery, consumption, and subsequent dispersal. Increased alcohol levels also increase ecological shelf life, as it were, through inhibition of bacterial growth and the postponement of associated rotting. Prior to actually tasting a ripe and fermenting fruit, it can be difficult to assess the quality of the contents. Animals (including us) will also sometimes eat only part of a ripe fruit and reject the rest. In evolutionary terms, plants will try to minimize their investment in sugars and other enticements to consume, whereas animals try to increase their net caloric gain per unit of time when foraging. Evolution of these kinds of mutualistic interactions often acts in reciprocal fashion and ultimately can yield more and more complex strategies of both entrapment and evasion (unfolding over millions of years) by all participants. Another possibility is that sufficiently high alcohol levels may actually deter consumption if certain animals find the taste aversive. Such an outcome might facilitate the growth of yeasts and ultimately their reproduction, but would work against the genetic interests of the plant if the seeds are never dispersed. In any event, there is no evidence to date demonstrating negative effects of naturally occurring alcohol on fruit consumption. The relative importance of alcohol in either attracting or deterring animal consumers is likely to be dependent on concentration and how it varies through time. The particular taxonomic identities of the plant, animal, and fungal participants in this three-way interaction will also be reflected in variable patterns of fruit ripening and the corresponding expression of alcohol. Given the huge number of flowering plants that produce sugar-rich fruit, together with the myriad kinds of mammals and birds that consume them, a wide diversity of behavioral and ecological outcomes can be expected. The sensory physiologies of animal frugivores (i.e., their capacity to smell and taste numerous fruit-specific flavors, including alcohol) should be similarly variable. When humans use yeast to produce beer and wine, we are typically limited to an alcohol content below 15% because of alcohol's inhibitory effects on the yeast's biochemical functions, and ultimately on its growth. Higher concentrations of alcohol can only be obtained via the chemical process of distillation, as discussed in detail in chapter 5. Moderate concentrations of alcohol are nonetheless highly effective as food preservatives, given the protective effect of the molecule against bacterial spoilage. Humans worldwide have converged on the partial fermentation of vegetables (e.g., sauerkraut) and milk products (e.g., cheese) for long-term storage. We even use ethanol or related compounds as a clinical swab prior to injections to kill off bacteria on our skin, indirectly enlisting the by-products of fungal metabolism to aid in our own microbial wars. Much of what we know of yeasts and alcohol production originated in the cultural processes of brewing and wine-making, as developed over millennia. Now, by using yeast to ferment mostly corn, wheat, and sugar cane, humans produce about thirty billion liters of alcohol every year. This amount represents the second-largest biotechnological product in the world, exceeded only by the harvest of both farmed and natural timber. About a quarter of our efforts in fermentation goes towards alcoholic beverages, and the remainder is used as industrial alcohol and motor fuel. Current interest in alternative fuels and gasoline additives will only increase this latter usage, and the microbial production of alcohol from plant products has a potentially lucrative future worldwide. My own university, by way of example, recently accepted hundreds of millions of dollars from British Petroleum to establish an institute for research into the commercial production of such biofuels. This impressive attempt at the greenwashing of oil profits amply brought home the energetic impact of the ethanol molecule. But what of alcohol production in the natural world? How often do yeasts and alcohol actually build up to significant levels within fruit? And are there other biological circumstances whereby alcoholic fermentation might occur in sugar-rich pulp or other kinds of biological products (e.g., nectar)? What do we know about the natural ecology of fermenting yeast on fruits in the real world, and particularly in the tropics? Yeasts grow best in sugar-rich environments, and their growth is facilitated by higher temperatures and relative humidities. An obvious inference, therefore, is that ripe fruits in wet tropical environments will contain the most alcohol relative to fruits in other regions of the world. To date, however, most available information on alcohol content pertains only to domesticated fruits found within the temperate zone, and particularly to grapes. These studies indicate concentrations in decomposing fruit that range widely, from trace quantities to values as high as 5%. Some of these studies must have been great fun, as they involved sampling grapes and wine seeps from the discard piles of vineyards. Although these are obviously artificial contexts for alcohol production, the local fruit flies have clearly become accustomed to its near unlimited availability, as we shall see in the next chapter. Some limited data on alcohol content are also available for bananas, strawberries, and some other kinds of commercial fruit crops. But such situations tell us very little about the natural ecology of fermentation and alcohol production by yeasts. Humans have domesticated grapes and other fruits for millennia. Through the process of artificial selection, we have dramatically altered their texture, taste, chemical composition, and appearance relative to their natural precursors. Because we don't like our fruits to be spoiled in any way, no matter how superficially, we apply lots of pesticides and fungicides during the ripening period. Artificial selection may also result in greater chemical defenses against microbial pathogens like yeast and bacteria, either for the sake of visual appearances, or simply to increase overall yield. So the data on alcohol levels within grapes and other agricultural crops, although suggestive, tell us basically nothing about what might be happening in the natural world with wild fruit and fermentation. The yeast strains that infect domesticated crops, as well as those used in breweries, also differ substantially in growth characteristics and in their physiological ability to tolerate alcohol relative to wild yeasts. If we instead consider ripening profiles and associated alcohol levels within naturally occurring fruits, the data are remarkably sparse. When I first started working on this problem, I actually could find no information whatsoever on the alcohol content of fruits eaten by wild primates. To offset this absence, I made a number of relevant measurements on the relatively large fruits of the palm Astrocaryum standleyanum (see plate 2). Fruits of varying ripeness conditions were obtained either from palm trees or from the forest floor on Barro Colorado Island in Panama and were then analyzed at the on-site field station run by the Smithsonian Institution. Categorization of ripeness (i.e., unripe, ripe, and over-ripe) was made a priori and somewhat arbitrarily conformed to my own personal preference, although surface color was clearly different among the three groups. The unripe green fruits contained no measurable alcohol, but the situation was very different for ripe and over-ripe fruits. Alcohol content for pulp of the former averaged 0.6%, whereas that for the latter was a relatively high 4.5%. Both ripe and over-ripe fruits also exhibited, in aggregate, a wide range of concentrations, indicating that color per se does not necessarily indicate the extent of fungal infestation. Nonetheless, alcohol levels within these fruits are non-trivial and correspond roughly to those found in weak beer. Given that 40% or so of any given palm fruit is pulp (as distinct from seed and husk), this represents a potentially substantial exposure to alcohol for any animal that consumes large amounts. Mammalian frugivores can eat up to 5 to 10% of their body weight per day in fruit, so daily low-level exposure to dietary alcohol should be expected in many species. I also regularly see large, iridescently blue Morpho butterflies sucking up goopy fermented liquid from these fallen palm fruits. At first glance, the measured concentrations of alcohol in the pulp may seem to be insufficient to enable actual intoxication. But as we all know, it's how much one drinks as well as the concentration that determines the physiological hit of alcohol and ultimately drunkenness. Here is where the data are really limited-we know essentially nothing about typical feeding rates for the animals that are known to eat these palm fruits. Still, this set of measurements was a first pass at the interesting question of alcohol levels in the wild, and it turned up fairly encouraging results. Additional measurements on fruit alcohol content have been made by my colleagues Carmi Korine, Berry Pinshow, and Francisco Sánchez at Ben-Gurion University, working on the flora of the Negev desert in southern Israel. It is perhaps surprising to hear about fruit growing at all in such dry conditions, but many local plants (such as mistletoes) seasonally provide large numbers of smallish fruit to migratory birds. Fruit bats also visit figs and palms throughout the Mediterranean and other semiarid regions of the world. For four species of ripe fruit in the Negev, alcohol content of the pulp was about 0.44%, somewhat lower than that for the Panamanian palm fruits but still potentially substantial depending on the amount consumed. Moreover, Nate Dominy (then at the University of California, Santa Cruz) measured alcohol content for seven tropical fruit species in Singapore and found values ranging from 0.12 to 0.42%.Clearly, fruits in the wild contain non-negligible amounts of alcohol, although the exact concentration will depend on the locale, season, ripeness, and of course taxonomic identity of the fruit in question. A key issue now is to determine the extent to which fermentation and alcohol levels are correlated with ripening profiles and with the relative attractiveness to fruit-eating birds and mammals. Ultimately, we would like to know how much alcohol is consumed in a feeding bout by these animals, and over what time period, so as to be able to estimate directly their physiological exposure. For the ripe and over-ripe palm fruits in Panama, alcohol levels and sugar content were inversely correlated, exactly as would be expected given that yeasts progressively ferment and deplete all available sugars. What we have no information on, however, is the simultaneous interplay between bacterial and yeast populations as a fruit ripens. The fate of alcohol produced within the fruit should strongly influence relative growth of these two competing groups. If alcohol indeed functions as an antibacterial killing agent, then yeast populations should increase up to maximum values well before the bacteria catch up, and then only slowly decline. For small fruits with large surface area-to-volume ratios, however, alcohol will diffuse relatively quickly out of the fruit's interior and into the surrounding atmosphere, yielding lower internal concentrations. Bacteria will probably do better under such circumstances. Larger fruits, by contrast, will retain more of the alcohol produced by yeasts, and thus would be predicted to have a higher alcohol content under comparable conditions. We might expect to see a longer delay in bacterial buildup in large fruits, which, among other effects, will tend to prolong their attractiveness and availability to animal frugivores. Other biological contexts can be also identified for sugar-rich solutions that ferment in the wild. Flowers typically (but not always) secrete nectar to attract pollinators and are often found in warm sunlit environments conducive to microbial growth. A recent study in Malaysia of a large palm flower found the nectar to be colonized by fermenting yeast, along with alcohol levels up to levels of 3.8% (and an average content of 0.6%). The interesting effects of this nectar on the various nocturnal mammals that consume it are discussed in chapter 3. The potential role of alcohol in attracting animal pollinators to flowers more generally has never been examined, although honeybees and wasps would be interesting subjects for such investigations. Many different birds (e.g., hummingbirds in the New World and sunbirds in the Old World) also feed primarily on floral nectar, as do the New World flower bats and many tree-dwelling mammals worldwide. Some nectars, moreover, contain low concentrations of chemical compounds that inhibit microbial activity, suggesting that fermentation may degrade sugar rewards and thus pose a real problem for flowers. Alternatively, alcohol odors might preferentially attract certain kinds of pollinators, and the evolutionary interactions between flowers and yeasts might accordingly be more complex. For example, bumblebees have recently been shown to prefer flowers containing nectar that has been artificially inoculated with yeast. The number of seeds in the flower are reduced, but yeast dispersal by the insects may be enhanced. Floral warming through yeast metabolism could also be attractive to some pollinators. Remarkably, neither attractive nor deterrent effects of alcohol alone on flower visits and pollinator preferences have been evaluated under natural conditions. Some plants with flowers also bear small cup-like structures called extrafloral nectaries on their stems and leaf bases that secrete low-concentration sugar solution in order to attract ants (see plate 4). Ants feed on these sugars for energetic reward and in turn defend the plant against herbivores such as caterpillars. Although never studied in this regard, these nectaries may also contain some low-concentration alcohol from time to time. Similarly, honeydew is exuded by aphids and other related species to attract ants that serve as bodyguards to these insects. As with nectar, honeydew contains low-concentration sugars and may similarly ferment prior to its consumption by the host-tending ants. Because microbial growth speeds up dramatically at higher temperatures, alcohol can build up to physiologically relevant concentrations in just minutes if yeast cells are present and if the underlying biochemical conditions are appropriate. Ants boozing on honeydew have yet to be identified but clearly can't be ruled out given what we know about the natural history and ecology of this system. Overall, it is clear that warm tropical environments are the likeliest places for naturally occurring fermentations. Yeast spores are borne by the winds and can land pretty much anywhere. And the plant-derived sugars they feed on are abundant within fruit, nectar, and even extrafloral nectaries. Fermentation and alcohol buildup are thus inevitable. For many animals, this is a great outcome given that they can potentially sense alcohol vapor over long distances and can reliably associate the odor of booze with substantial energetic reward. Fruits in the tropics are of particular interest in this regard given their wide taxonomic diversity, along with the numerous and physically large bird and mammal species that eat these fruit and literally carry out (in their gut) the services of seed dispersal. Real data on fruit-alcohol content are few and far between, however. Many animals in the tropical rainforest are likely to be consuming alcohol, but both the timing and extent of such exposure are unclear. Nonetheless, booze is clearly out there in the real world, and the next logical step is to look at the behavioral responses of different kinds of animals to alcohol. As we shall see, both fruit flies and barflies (the human kind) are well-studied in this regard, but the natural biology of alcohol exposure in all other animals is otherwise wide open and ripe for exploratory investigations. Robert Dudley is Professor of Integrative Biology at the University of California, Berkeley, and Research Associate at the Smithsonian Tropical Research Institute in Panama. His research on the evolutionary origins of alcohol consumption has appeared in numerous journals. Why do we drink alcohol? The Drunken Monkey Argument. 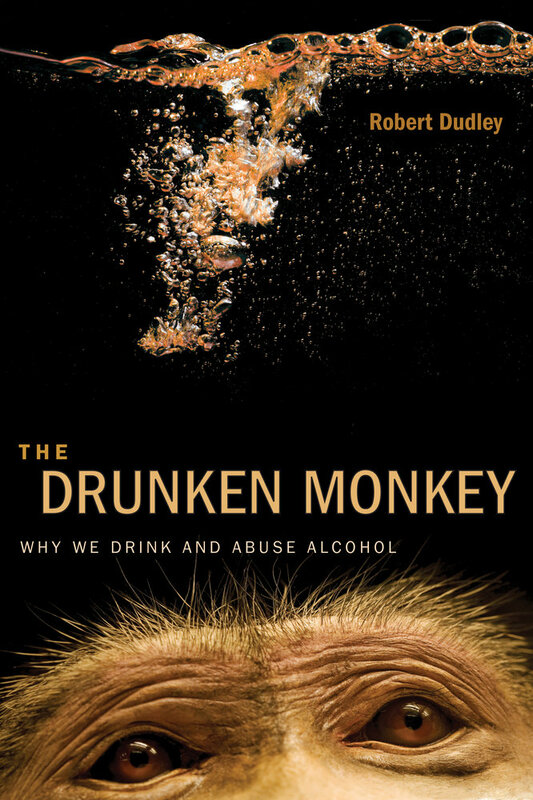 Evolutionary biologist Robert Dudley discusses his new book and its implications for understanding alcoholism. Video by Roxanne Makasdjian & Phil Ebiner, UC Berkeley.